The soft natural boar bristles brush detangles the thickest beards and the comb is strong and will easily glide through mustaches and longer beards. The handles have a tortoiseshell appearance and maintain their luster throughout the life of the product. Care: Remove any hair from the brush using the comb. Fill your bathroom sink with warm water and a dab of shampoo. Soak the comb, for a few minutes. However, do not soak the brush. Rather, swirl the brush through the soapy water and then rinse the brush. Remove excess water and let the brush air dry. The brush is hand made of Boar bristle and cellulose acetate handle featuring a gold-stamped logo. 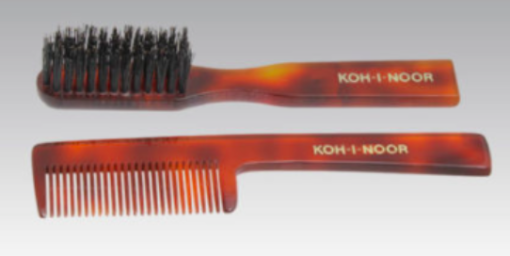 The comb is also cellulose acetate, extremely durable. My girlfriend got met this set for my birthday and I really like how well shaped my beard is. It used to get out of control but with the right tools I can keep it looking very clean and defined. Big facial hair doesn’t have to be messy. It’s all in the grooming and the tools. I love this brush and comb! Simple but they really work. I like my beard and mustache but sometimes it’s really hard to maintain. This boars hair brush and comb are perfect and give my face a clean, sharp look.